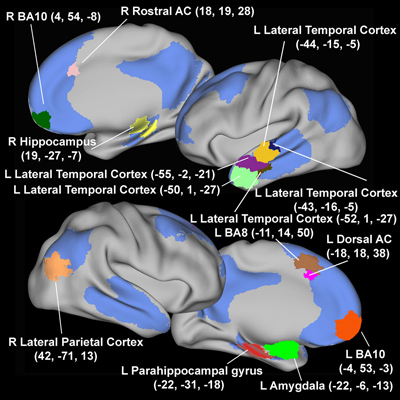 Images of the brain from various angles show the default mode network (in blue). All of the other colors within that default network show brain regions that are overactive in people with depression. WASHINGTON-ST. LOUIS (US)—People with depression may not be able to “lose themselves” in work, music, exercises, or other activities that enable most healthy people to get “outside” of themselves. A study by neuroscientists at Washington University School of Medicine in St. Louis demonstrates that brain regions, collectively known as the default mode network, behave differently in depressed people. The default network typically is active when the mind wanders. It shuts down when an individual focuses on the job at hand. But the researchers found the network stays active in people who are depressed, even when they are concentrating on specific tasks. Raichle, a professor of radiology, neurology, neurobiology, psychology and biomedical engineering, says one characteristic of the default network is that it tends to involve self-referential functions. For example, it may involve memories, not just memories of facts or information but about our own experiences and how they relate to that information—the difference between remembering that hijacked planes crashed into the World Trade Center on September 11 and remembering where you were when you watched or heard about the attack. Brain regions in the default network assess what is going on inside of us, to survey the effects of the environment around us and to make judgments about whether or not we approve. Scientists have linked the network to inward-looking activities, a kind of internal narrative of our life stories. The research team used functional magnetic resonance imaging (fMRI) to scan the brains of 20 people with major depression as well as 21 individuals who were not depressed. None of the people in the study were being treated with antidepressant drugs at the time of their brain scans. Once in the scanner, subjects were shown pictures designed to evoke emotion, from snarling dogs and violent scenes to pictures of flowers and smiling faces. Sometimes, study subjects simply reacted to the picture as they saw it. At other times, they were coached to regulate their responses. That is, if they saw a frightening picture of a snarling dog, they might remind themselves it was an imaginary scene or think to themselves that the dog was behind a fence and unable to hurt them. Whether subjects simply reacted to the pictures or regulated their responses, brain regions in the default network became inactive as healthy participants looked at and responded to the pictures. Not so for those with depression. Sheline says the depressed people in the study seemed to be more affected by the pictures than the healthy, control subjects. It was harder for them to detach the way people without depression could. As she continues this research, Sheline now is looking at the brains of depressed people following treatment with antidepressant drugs. Preliminary results suggest that their default networks function more normally. She’s also planning to test cognitive behavior therapy to see whether it might help “reset” the brain’s default network in people with depression. The hope, she says, would be that treatment—either with medication or cognitive behavior therapy or both—might help deactivate overactive brain regions that keep depressed people embroiled in depressive thoughts and, in fact, reset the brain to function more normally.